The Only Paint Finishing System Officially Licensed by NASCAR. 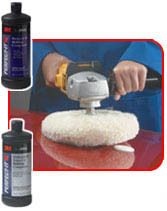 Have some automotive paint problems and want a straight-forward way to finish your paint job? Check out the 3M Perfect-It III. 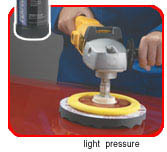 For safety always wear goggles and face shield when grinding or sanding. The 3m Perfect-It III-Trizact System is an easy, and fast, solution to Spot and Small Panel Repairs. Follow these 4 easy steps and your panel will be as good as new. To remove nibs, runs, or sags Sand with DA. Buff to remove sand scratches completely. Apply light pressure. Suggested buffer speed: 1800 RPMs. Make one pass with DA. Do one panel at a time. Check here for other great 3M products. Need more information about earlier steps in the process, like prepping for paint, or maybe a complete guide on how to paint a car?